The Egyptian Football Association (EFA) is coordinating with all authorities to resume the Premier League season a week after a stadium disaster killed 20 supporters. The Zamalek fans died on Sunday after police used teargas to disperse crowds attempting to enter Cairo’s Air Defence stadium ahead of a match with ENPPI. "The cabinet will make the final decision on Wednesday regarding the league’s future and fan attendance," EFA board member Mahmoud El-Shamy stated to Ahram Online on Sunday. 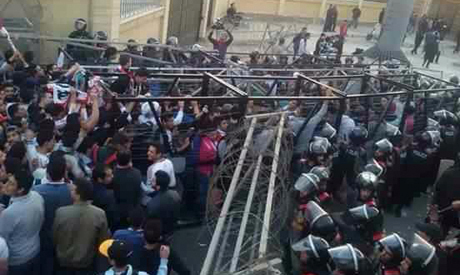 It is expected that the league will resume behind closed doors as did all matches held in the country after the Port Said stadium disaster that left 72 Ahly fans dead following clashes with rivals Masry. "We will hold a meeting with the EFA to announce the return of league games which will be in two weeks," Prime Minister Ibrahim Mahlab said in an interview with Emirati TV channel Dubai last week. "The Premier League will be back soon as it affects a huge number of Egyptian people," he added. Investigations into the causes of the tragedy are ongoing.